An area favorite for many years, Kenny's hamburger sauce has returned to help raise funds for Habitat for Humanity. William Kenney, 81, sells his secret hamburger sauce out of the trunk of his car. In four years, he has sold more than 1,100 bottles that way. Kenney, of Roanoke, is not just some man with his own special recipe. He is the former owner of Kenney's, the one-time regional fast-food chain. He said the sauce - Original Kenney's Meat Sauce - is the special concoction he used to dip hamburgers in before serving them to millions of customers. While the chain officially shut down in the early 1980s, Kenney has resurrected the sauce as a way to raise money for Habitat for Humanity in the Roanoke Valley, selling the stuff for $10 a quart. Four years ago, Kenney teamed up with Bill Roble, the food service manager at Hollins University, to organize a Kenney's Day on campus. The pair broiled hamburgers outside the cafeteria and made a large batch of Kenney's secret, ketchup-based sauce. "That's when the idea struck me," Kenney said. "If it weren't for Bill Roble, we wouldn't be doing it now." The money Kenney raised at Hollins was donated to the university for a student group that was building a Habitat house. After developing a friendship with Roanoke College Chef Bob Proffit, Kenney based his operation in the college's kitchen where there was enough space to refrigerate the sauce. Kenney can produce about 100 jars a day, working for two to three hours with Proffit and one other Roanoke College employee. In a 60-gallon stock pot, the three mix and stir all of the ingredients to produce Kenney's locally famous barbeque-flavored sauce. "The sauce has to be mixed by hand with a big paddle, and I am just getting too old to do that myself," said a grinning Kenney, who appreciates the help from Proffit and kitchen staff. He also pointed out that every jar is sterilized in the kitchen dishwasher before being filled. Proffit, who grew up on Kenney burgers and met Kenney for the first time at an American Culinary Federation meeting, said he hopes producing the sauce at the college will help spread the word about the fund-raising project. "The students are going to start taking the sauce when they go out to do fund-raising, and also with all of our students from up North, it may be able to travel home with them," Proffit said. The Kroger Co. donates many of Kenney's supplies, including the jars, so that more money can go toward the cause. Kenney also stressed that many members of Kroger's management team have worked on Habitat houses. In 1989, when Kenney retired, he became involved with Habitat as a member of its board of directors. At the time, the chapter had built only four houses; now, there are more than 100. He served on the board until 1995, and now sits on the building committee, which searches for locations and decides what types of houses to build. On Jan. 19, Habitat dedicated a house in Salem that Kenney and the City of Salem co-sponsored. Each gave about $10,000 to the house. A Habitat house generally costs about $43,000 to build. In addition to his work with Habitat, Kenney is on the advisory board for the Salvation Army in Roanoke, was a member of the Kiwanis Club, and volunteers with International Executive Service Care, a government organization that "sends people around the world to show people how to organize any business or trade," Kenney said. Through the IESC, Kenney has been sent to Bulgaria, Russia and Ukraine as a food expert, teaching people of less-developed countries how to start a business and make a profit. Last spring, Kenney helped organize a pizza franchise in Ukraine. "It helps the U.S., too, because it encourages the use of U.S. products," he said. "Also, when people are in better [economic] shape, there is less chance of war." Kenney, a native of Edmonton in western Canada, got into the food business at the University of Toronto, where he studied institutional management. After serving in the Canadian navy for three and a half years during World War II and working in naval aircraft factories, Kenney had gained a lot of engineering experience. But the university's program had more than 30,000 students. A counselor at the school suggested institutional management instead, in light of the depression, pointing out, "At least you'll eat." Kenney graduated in 1949, and spent a year after college in Switzerland studying hotel management. The experience inspired him to join the IESC. He then moved on to attend the Culinary Institute of America in Hyde Park, N.Y. He eventually worked his way down to Glasgow, Va. and in 1952 he opened his first restaurant, the Hob Nob, in Radford. In 1956, he opened his first fast-food business in Radford, originally called Biff-Burger and changed two years later to Kenney's. He opened his first Kenney's in Roanoke in 1958. Instead of adding lettuce and tomato to his burgers, he dipped them into the sauce, giving them a tangy barbeque flavor. "The sauce is like Dr Pepper compared to Coca-Cola," he said. "It's so different from the other hamburgers that I think it was one reason we were so successful." While Kenney's couldn't compete with the larger franchised fast-food chains, he has maintained a loyal following of Kenney's sauce fans who remember it from childhood. "I've got people calling from Florida and Georgia who grew up on my burgers, but the sauce has to be refrigerated so I can't ship it," Kenney said. Kenney is working on organizing other Kenney's Days at Roanoke College, and possibly at Hollins and other places around Roanoke. "We hope to continue making it as long as there's a market for it," said Kenney, who hopes to return to Ukraine this summer to help a man begin a chicken processing plant. "Proceeds will always be given to Habitat or some other charity." 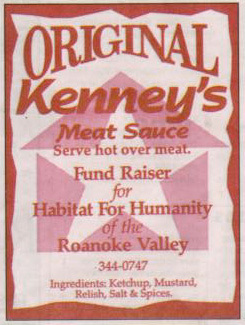 To purchase Kenney's Sauce, call William Kenney at (540)774-6103 or Habitat for Humanity at (540)344-0747. Kenney sells his famous sauce for normally around $5 a quart jar. For more information about William Kenney's restaurant chain "Kenney's", visit "Home of the famous Kenney Burger" website !